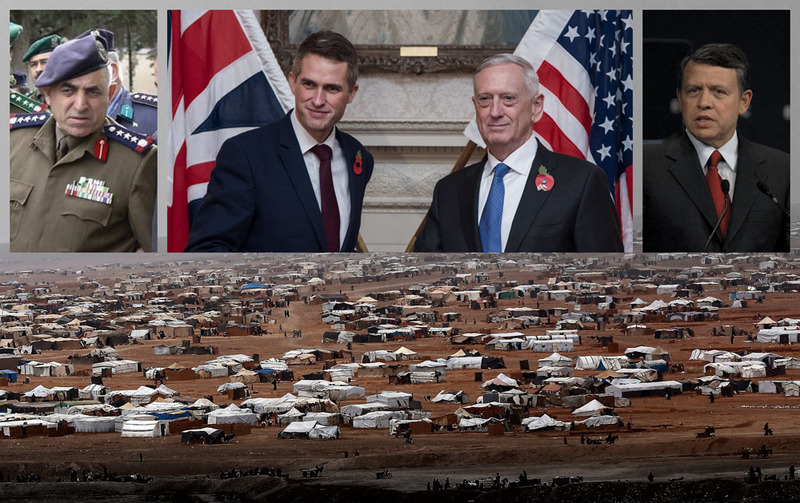 With millions of people under threat in Idlib, what can the UK do? Five children were killed by Russian aircraft in Jisr al Shughur, Idlib, yesterday. Track and publish details of air attacks on civilians. Sanction Russians with command responsibility. Deter ALL attacks on civilians, not just chemical attacks. Support and protect civilian local government. The UK, US, and France have warned the Assad regime that they will take action if the Assad regime uses chemical weapons in attacking Idlib. However the UK, US, and France are offering no deterrence against any other bombing of civilians, whether by Assad or Russia. Idlib is supposed to be a protected zone under a de-escalation agreement made between the Russian, Iranian, and Turkish governments, but over the last year other de-escalation zones have been subject to massive attacks and forced displacements by the Assad regime and its Russian and Iranian allies. The boundary of the Idlib de-escalation zone is marked by Turkish, Russian, and Iranian military observation posts. Military control within Idlib is contested by Hay’at Tahrir al-Sham (HTS) armed groups and National Liberation Front armed groups. HTS includes the former Jabhat al-Nusra, historically linked to al-Qaeda. The National Liberation Front groups opposing HTS are backed by Turkey. Political control within Idlib is contested between HTS and local councils, some of them democratically elected. 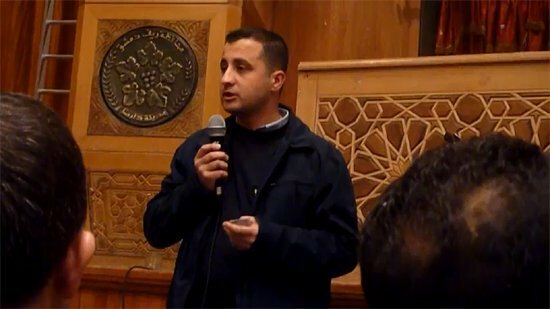 Syrian civil society groups and civilian local government have spent years resisting both the Islamist extremists and the Assad regime. 1. Track and publish details of air attacks on civilians. The RAF tracks military aircraft across Syria as part of its contribution to the anti-ISIS Coalition. According to the RAF, its E-3D AWACS aircraft provides ‘big picture’ situational awareness for Coalition aircraft and early warning of aircraft movements outside Coalition control, while Air Vice-Marshal Stringer recently told the Defence Select Committee that the RAF’s Sentinel stand-off radar provided about 25% to 30% of the overall Coalition contribution. The UK should publish radar tracking data on attacks by Russian and Syrian aircraft against civilian targets, in order to help identify those with command responsibility, to establish grounds for future prosecutions, and to make the case for targeted sanctions against those implicated in war crimes and crimes against humanity. MPs of various parties have raised this issue with ministers, only to receive boilerplate replies suggesting that security considerations prevent publication, but when Assad’s air force dropped nerve agent on the town of Khan Sheikhoun in April 2017, the US published tracking data to show the regime was responsible. If it could be done in that case, it can be done for other attacks on civilians. Publish the radar tracking data. Identify the bases of origin for individual attacks, and identify individuals with command responsibility. 2. Sanction Russians with command responsibility. Russian forces in Syria have attacked hospitals, schools, rescue workers, crowded marketplaces, and even a UN aid convoy. They have faced not one single sanction in consequence of these criminal attacks. The UK coordinates its international sanctions with the EU. A key reason for calling on the UK Government to publish aircraft tracking data is to make a public case for international sanctions against Russian individuals and entities implicated in war crimes and crimes against humanity. 3. 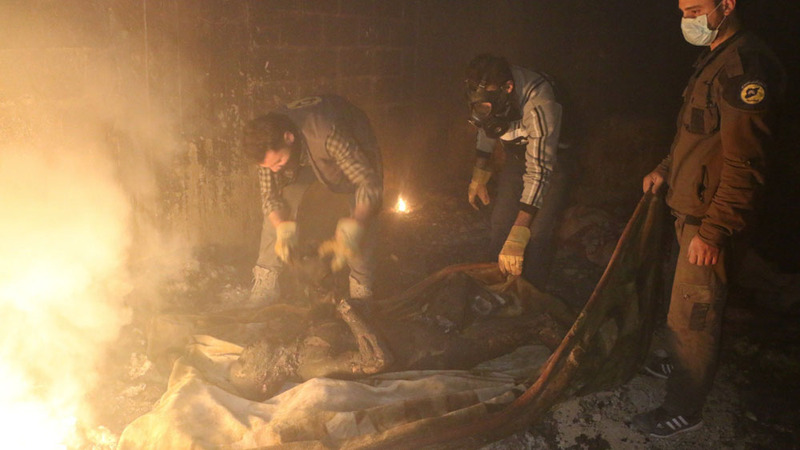 Deter all Assad regime attacks on civilians, not just chemical attacks. The UK, US, and France have warned the Assad regime that they will take action if the Assad regime uses chemical weapons in attacking Idlib. 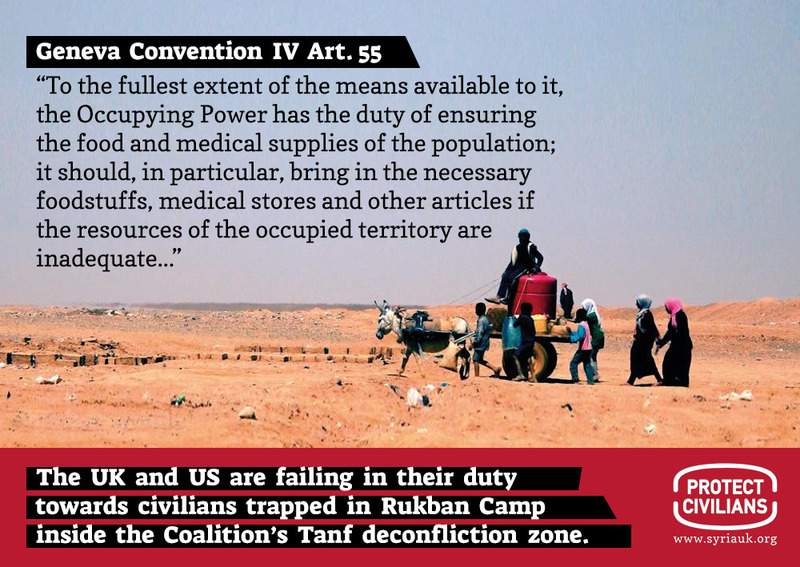 However the UK, US, and France are offering no deterrence against conventional bombing, artillery, barrel bombs, cluster bombs or incendiary attacks, all of which are regularly targeted against civilians in Syria. As the UK, US, and France ready a response to any chemical attack, they should also publicly declare themselves willing and ready to respond to other attacks on civilian targets such as hospitals and schools, and to respond to other indiscriminate weapons such as cluster munitions, incendiaries, and barrel bombs. 4. Support and protect civilian local government. Civilians in Idlib are under threat by armed groups who have been responsible for torture and killing, but the answer is not to allow those armed groups to be replaced by the Assad regime which is responsible for even more torture and killing. 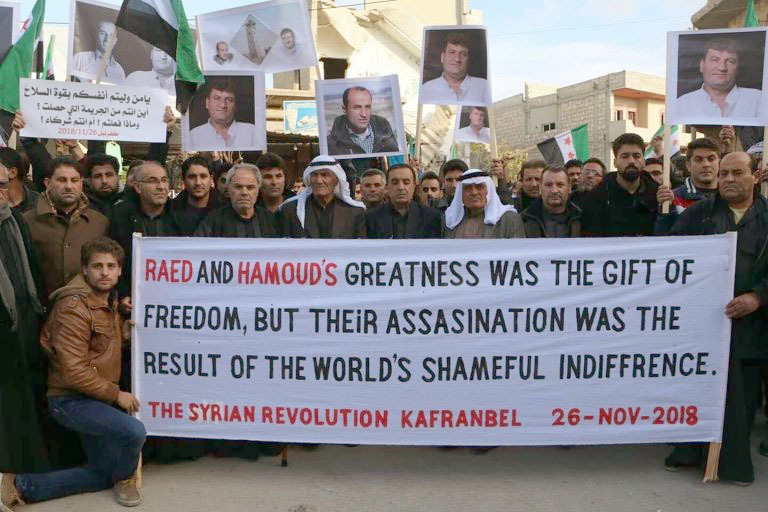 Civil society and local civilian government have resisted both extremist armed groups and the Assad regime. They need to be supported. The recent withdrawal of UK funding for Free Syria Police and local councils was a step backwards. Ending the external threat to Idlib from the Assad regime needs to be matched by planning and resources to support civil governance and civil society inside Idlib. On the early morning of 21 August 2013, the Damascus suburbs of Zamalka and Ein Tarma in Eastern Ghouta, and Moadamiya in Western Ghouta, were attacked with rockets loaded with Sarin nerve agent. An estimated 1,500 people were killed. 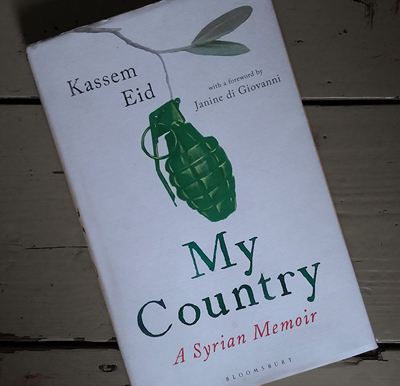 Kassem Eid, then 27 years old, was amongst the survivors. Laila Alodaat, Haid Haid, and Dr Farouq al Habib before the Committee. The House of Commons Foreign Affairs Committee is currently holding an inquiry on the Responsibility to Protect (R2P) and humanitarian intervention to protect civilian populations, with specific reference to Syria. Witnesses at the most recent hearing (video) were Dr Farouq al Habib, Director, Mayday Rescue Foundation; Laila Alodaat, Middle East and North Africa Director, Women’s International League for Peace and Freedom; and Haid Haid, Research Fellow at the International Centre for the Study of Radicalisation, King’s College London. The 2011 Libyan and Syrian revolutions began within weeks of each other, and the Libya intervention profoundly affected international responses to Syria. 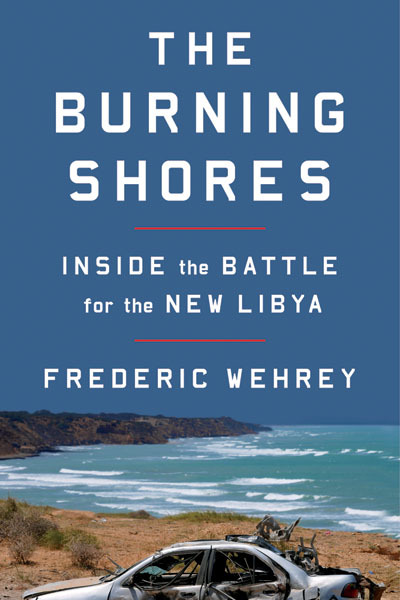 Bronwen Griffiths reviews a new book by Frederic Wehrey on the Libyan experience. The idea of an international ‘responsibility to protect’ (R2P) and a possible enforcement of human rights is seen as a way of preventing authoritarian governments from hurting their own populations. In a contrast to Libya, the violent protests in Syria, which were met with extreme violence by the Assad regime, demonstrates the limits of this idea. This raises questions about the international context of the intervention in Libya, and possible reasons for differences between the two countries. Elizabeth Tsurkov: “Over the past two days, sources in Quneitra tell me that Israel provided additional humanitarian assistance to camps for the displaced on the fence along the Golan, but situation there remains desperate.” Photo: Alaa al-Fakier. 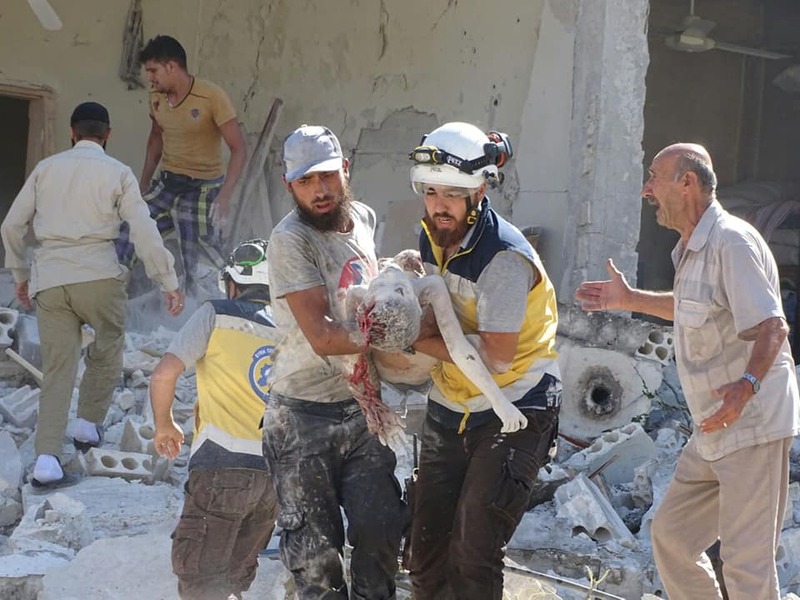 The UN has received reports of dozens deaths, including women and children, as well as reports of indiscriminate attacks on health facilities, schools, civil defence centres and offices of local NGOs. Health and educational facilities are closed due to airstrikes and ground hostilities. 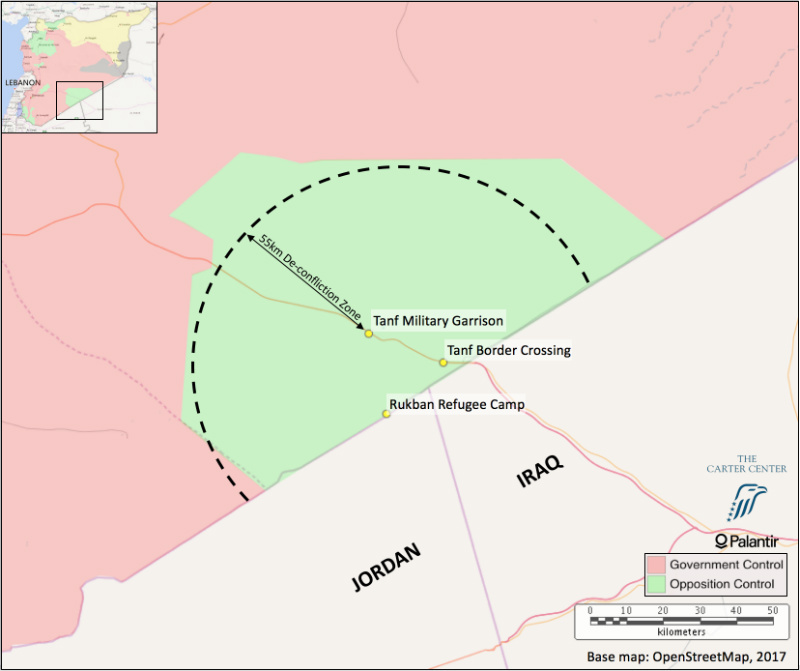 The Governments of Jordan and Israel are keeping the borders closed to Syrian civilians fleeing the bombing. 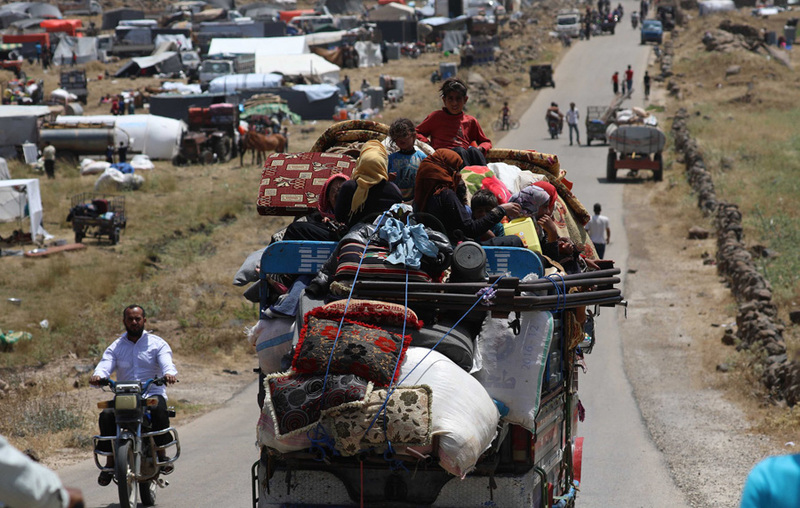 In the case of Israel it is preventing displaced Syrians seeking shelter in the Golan Heights which is Syrian territory under international law, despite Israel’s control of the area. UK DFID officials have expressed the view to multiple NGOs that it is not realistic that Jordan will be able to take in more people. But leading NGOs’ assessment of the situation in southern Syria is that it is currently impossible to provide adequate aid inside Syria to most people fleeing the fighting. Aid agencies say they are ready to assist new arrivals in Jordan. Azraq Camp could be developed further to host another 80,000 new Syrian refugees. Jordan is a UK ally, and the UK and US have close relations with Israel. The UK should call on allies to give refuge to civilians, and not call on NGOs to do an impossible job in a war zone. Most discussion of the UK’s failure to protect civilians in Syria focuses on the August 2013 vote against action following the Ghouta chemical attack. But there have been many other points at which the UK could have chosen to act but didn’t, with dreadful consequences. The UK failed to act to relieve the siege of Madaya imposed by Hezbollah, resulting in the death of civilians including children by starvation, mines, and gunshots, mass displacement, and the strengthening of an armed group proscribed by the UK as a terrorist organisation. 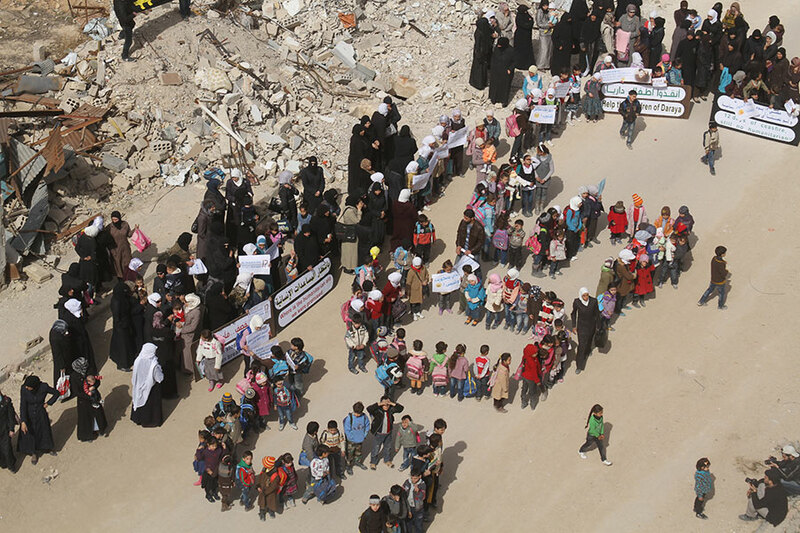 The UK failed to act on its own May 2016 proposal to airdrop humanitarian aid to besieged communities such as Daraya, resulting in the depopulation of entire towns. The UK failed to publish radar tracking evidence of Russian attacks on hospitals and on a UN aid convoy during the siege of Aleppo, evidence that could have allowed Russian individuals with command responsibility to be sanctioned. The UK failed to invest in UAVs that could have airdropped medical supplies and even food to besieged communities in eastern Ghouta, a besieged region that had large areas of open farmland suitable for airdrops. The UK is failing now in southern Syria: Failing to publish evidence on culpability for hospital attacks, failing to sanction Russian individuals with command responsibility, failing to get aid through, failing to press allies and work with allis to give shelter to refugees, failing to act against proscribed organisations involved in attacks, and failing to enforce UN Security Council Resolution 2139 by grounding Assad’s bombers. As seen again in recent reporting by The Sunday Times, the RAF has the ability to act against the Assad regime when UK political leaders give them the green light. 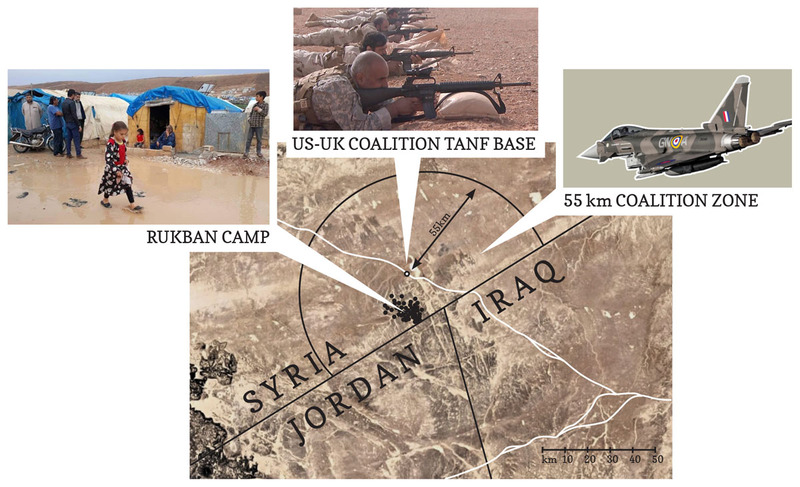 And the UK’s allies have the means—with UK support—to give shelter to civilians. We have seen some of the costs of not acting in the past. What will be the cost of not acting today? 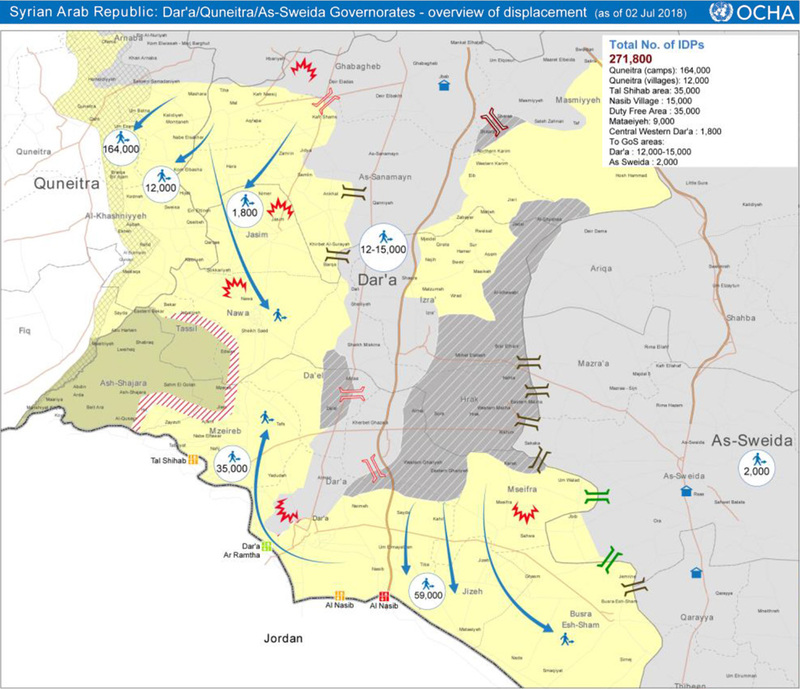 Below: Map from the latest UN Office for the Coordination of Humanitarian Affairs report. SyriaUK activists were at the London Stadium for the West Ham vs Man City game today, campaigning against Putin’s hosting of the World Cup. 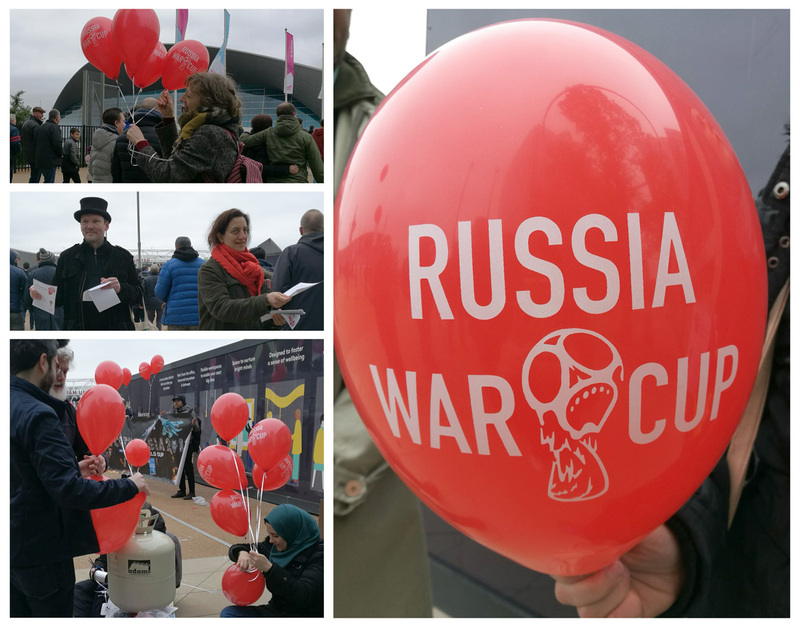 With ‘Russia War Cup’ balloons and leaflets, we got a good response from very many fans. 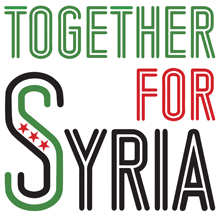 Also today, Rethink Rebuild, the Syrian community organisation in Manchester, are bringing the campaign to Old Trafford football ground, the home of Manchester United. 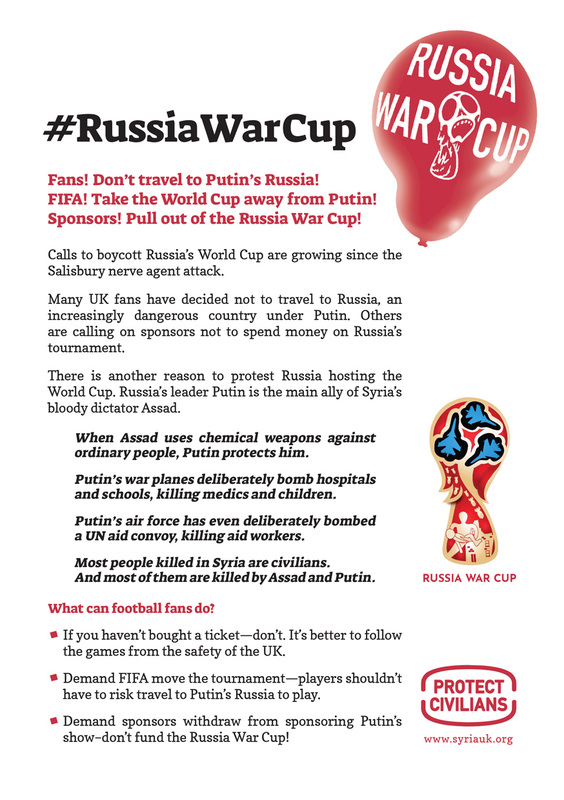 Syria Solidarity UK and Rethink Rebuild urge fans not to travel to Putin’s Russia. We call on FIFA to remove hosting rights from Russia, and call on all of the companies and organisations sponsoring the World Cup to pull out. The World Cup has served as a symbol of unity and fair play among nations, but this year FIFA has decided to hold it in a country ruled by a regime which is a danger to world peace. By giving the tournament to Putin, FIFA is offering legitimacy and prestige to a regime which is committing murder on a daily basis. Every day in Syria, Russian planes are bombing towns and cities, schools and hospitals in support of the genocidal dictator Bashar al-Assad. The Russian state is complicit in the regime’s continued use of chlorine and sarin chemical weapons, and has carried out its own chemical attack in the UK. 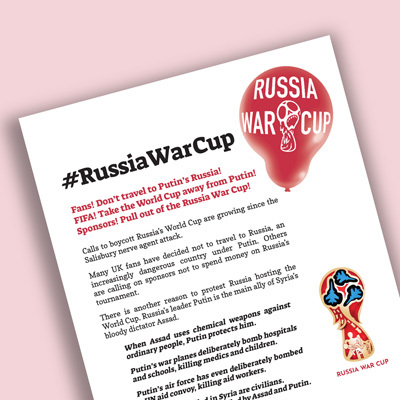 Say NO to the Russia War Cup. 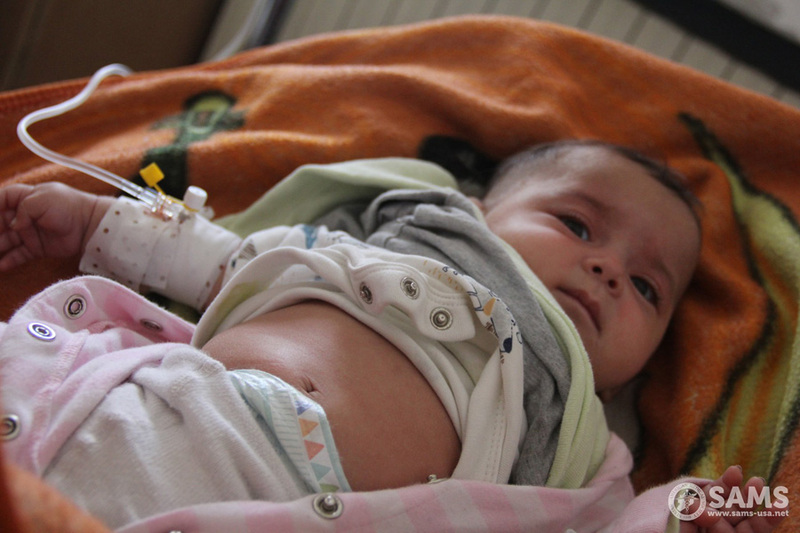 Five-month-old Rukaya being treated for pneumonia at a SAMS-supported hospital in Idlib. Read more. UK to spend £450 million on aid to alleviate suffering in Syria but won’t act to end hospital attacks. UK aid includes blast proofing materials and sandbags to reinforce underground hospitals. UK says Syria strikes were to protect civilians—but allows Assad’s attacks on hospitals to continue. The UK’s international development minister Penny Mordaunt has announced that the UK will provide at least £450 million this year to alleviate the extreme suffering in Syria. With at least 30,000 people currently injured every month in Syria, the Department for International Development (DFID) expects that around a quarter of this UK aid will be spent on healthcare. 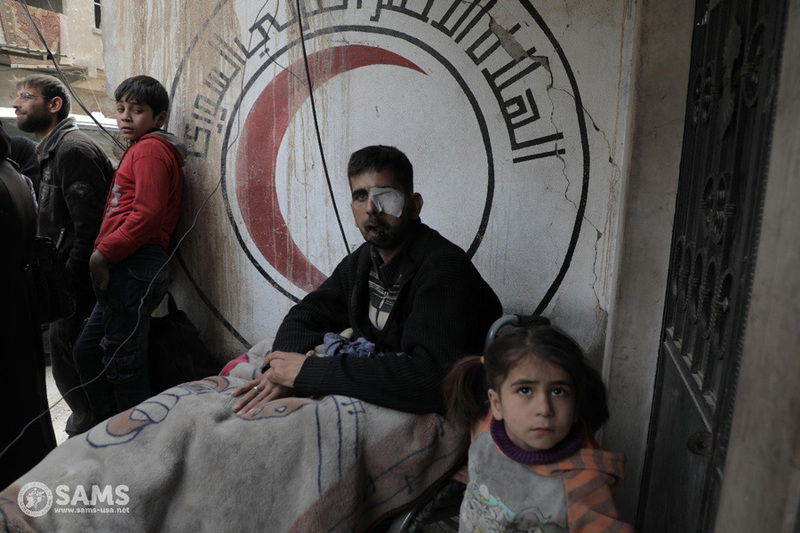 Assad and Putin deliberately and systematically target civilian hospitals as part of their campaign to drive ordinary people out of opposition areas and out of Syria. This is why UK aid includes providing blast proofing materials and sandbags to reinforce underground medical facilities and limit the damage from attacks. Hospital attacks should be a red line. The UK, US, and France should show the same determination to STOP these attacks on medics as they do to stop chemical attacks. The UK claimed its response to the Douma chemical massacre was an emergency measure to protect civilians. If that is true, then extend the same protection to Syria’s doctors, nurses, and patients. Don’t just spend money picking up the pieces and reinforcing hospitals against attack. 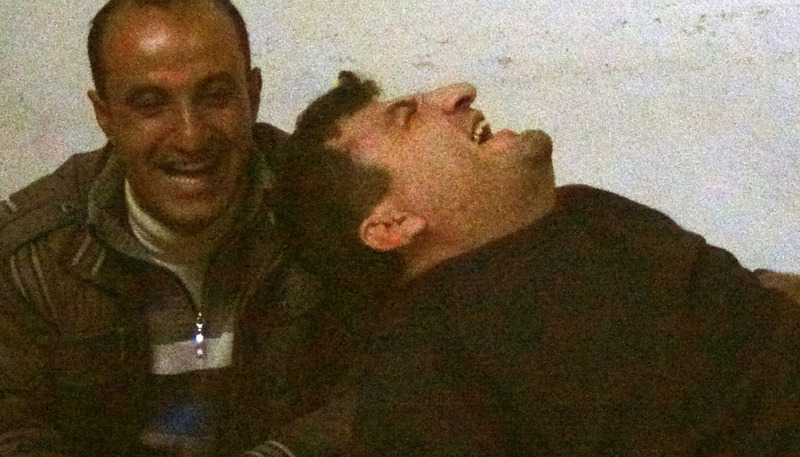 British doctors have been amongst those targeted by the Assad regime. 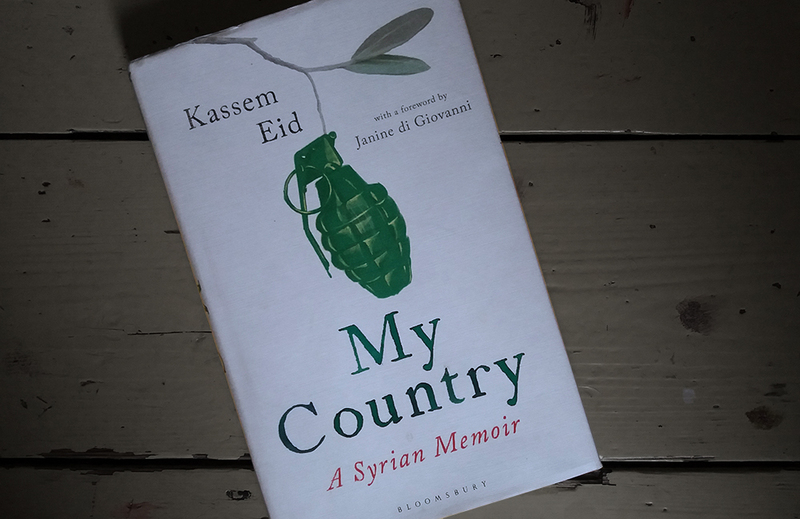 British surgeon David Nott has described the experience of being in the sights of one of Assad’s pilots and surviving. Another British doctor, Isa Abdur Rahman, 26, died in May 2013 in a mortar attack on a hospital in Idlib province. Dr Rahman had left his position with the Royal free Hospital in north London to volunteer with a British charity working in Syria. In 2016 two Conservative MPs, David Davis and Adam Holloway visited Syria and met Assad. Syria’s dictator gave David Davis a list of 783 people the regime was targeting for assassination. Assad’s ‘kill list’ included the same Dr Isa Abdur Rahman who had been killed in 2013, confirming again that Assad targets doctors. Eastern Ghouta, March 2018. Photo via SAMS. Physicians for Human Rights counted 492 attacks on medical facilities in Syria up to the end of 2017. 446 of those attacks were by either Assad regime or Russian forces. Now newly published research suggests the true total number of hospital attacks by Assad and Putin is even higher. Dr. Rohini Haar, University of California, Berkeley, led a team that collected ground reports of attacks in 2016 in northern Syria, filed by civilians via cellphone text. The data shows a total of 200 health care-related attacks in the governorates of Aleppo, Idleb, Homs and Hama in 2016, an average of more than one attack every other day. This is over twice the number (90) counted and verified by Physicians for Human Rights in those same areas in the same 2016 period. A recent report by The Syrian Archive implicated the Russian air force in four hospital attacks in January in Idlib province, Syria. Using data from the aircraft spotters who provide early warning to Syria Civil Defence, the report concluded that Russian aircraft were most likely responsible in each case. The UK and its military allies are in a position to provide corroborating evidence of Russian responsibility, but choose to keep this evidence secret. As part of the Coalition’s war against ISIS in Syria, NATO’s AWACS aircraft track all military aircraft in Syrian airspace, including Russian and Assad regime war planes. MPs of several parties have repeatedly asked the Government to find a way to publish radar tracking data relating to hospital attacks and other likely war crimes. When Assad’s air force dropped nerve agent on the town of Khan Sheikhoun in April 2017, the US published tracking data to show the regime was responsible, but the same hasn’t been done for any of the hundreds of hospital attacks. Most recently, Roger Godsiff MP asked the government to look again at “publishing tracking data on Russian violations of the Syrian ceasefire in a form that is compatible with security requirements,” only to once more receive the stock reply that it “would not be appropriate to publish” that kind of information. 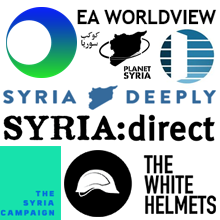 With the UK and its allies unwilling to publish corroborating evidence from aircraft tracking data, medics under fire are dependent on their own reporting and the reporting of other civil society organisations like Syria Civil Defence, AKA The White Helmets. The White Helmets have been targets of Russian propaganda since 2016 when they helped gather evidence of Russian attacks on a UN aid convoy. Now Russia is beginning to target doctors working in Syria with a similar disinformation campaign, apparently with the aim of undermining the credibility of their evidence in the eyes of the public, and of preparing for further attacks on hospitals and health workers. The UK needs to stand by doctors, nurses, and patients, not just by writing cheques for ever more medical supplies and fortified underground hospitals, but by taking action to stop hospital attacks. The UK needs to actively defend medics by publishing the evidence on hospital attacks to make the case for sanctioning Russia’s criminal war machine. The UK needs to take enforcement action against Assad on hospital attacks as it has on chemical attacks. We Exist is an alliance of Syrian civil society groups working inside Syria and in the diaspora. This week they are in Brussels taking part in the UN and EU’s second Brussels conference on Syria. On UN peace efforts, they say peace is only possible if Syrian organisations and democratic institutions play a leading role in the humanitarian response and any rebuilding of the country. Syrian civil society organisations are providing millions of people with education, food, water, healthcare and humanitarian aid, despite daily bombardment and fighting. The organisations in We Exist call for the protection and involvement of Syrian human rights and civil society groups to ensure that abuses such as sexual violence, forced displacement and targeting of civilians are documented, monitored and ultimately, prevented. A Special Tribunal should be established for war crimes and crimes against humanity committed in Syria. ‘Investing in an active, vibrant and fully-funded civil society is the only hope for a peaceful and democratic Syria. As Syrian human rights and humanitarian workers, we are doing all we can to empower young men and women, train local leaders, document human rights abuses, advocate for property rights and treat traumatised children but we can’t do it alone. Stop the bombing of civilians and use of prohibited arms (not just chemical weapons), as well as the deliberate targeting of schools, hospitals and civilian infrastructure. Halt the forced displacement of civilians. People have the right to remain in their homes, safe from bombardment or illegal detention. 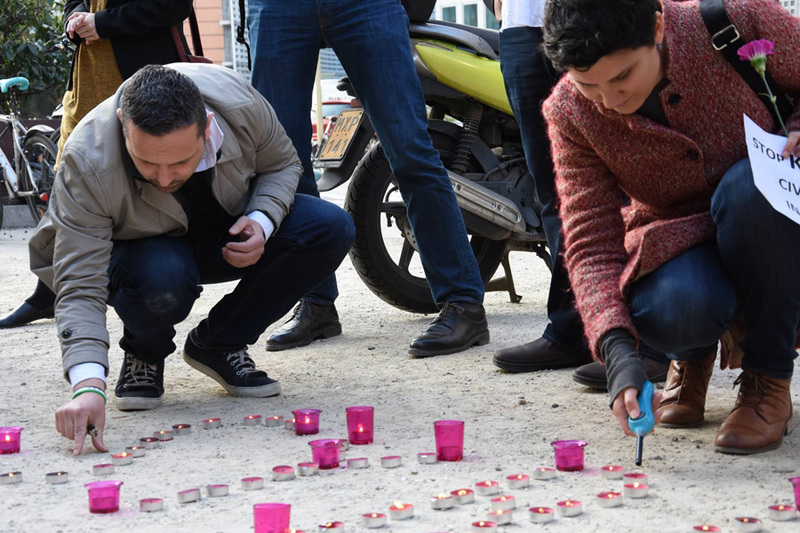 Guarantee safety for civil society organisations, including legal recognition and protection. Support survivors of sexual violence and prosecute the perpetrators. Ensure humanitarian programmes address the need of young men and offer alternatives to violence. Anyone who wishes to return home, needs support to do so—with health, psychological and education services, as well as reconciliation programmes. Pressure the Syrian government and all warring sides to release a list of names of all detainees, along with their current locations and statuses, and to immediately stop torture and mistreatment. Abolish exceptional courts, especially field, sharia law, war and counter-terrorism courts and guarantee fair trials under a supervision from the United Nations. Establish a Special Tribunal for war crimes and crimes against humanity committed in Syria. Consider Civil Society a leading partner in all issues concerning the future of Syria—whether it is humanitarian or development work, reconstruction or rebuilding. Accountability should be ensured for all war crime committed and for the use of all prohibited arms, not just chemical weapons. Full press release via Women Now For Development.